Researchers have now demonstrated the ability to create amorphous metal, or metallic glass, alloys using three-dimensional (3-D) printing technology, opening the door to a variety of applications – such as more efficient electric motors, better wear-resistant materials, higher strength materials, and lighter weight structures. “Metallic glasses lack the crystalline structures of most metals – the amorphous structure results in exceptionally desirable properties,” says Zaynab Mahbooba, first author of a paper on the work and a Ph.D. student in North Carolina State University’s Department of Materials Science and Engineering. Unfortunately, making metallic glass requires rapid cooling to prevent the crystalline structure from forming. Historically, that meant researchers could only cast metallic glasses into small thicknesses. For example, amorphous iron alloys could be cast no more than a few millimeters thick. That size limitation is called an alloy’s critical casting thickness. The technique works by applying a laser to a layer of metal powder, melting the powder into a solid layer that is only 20 microns thick. The “build platform” then descends 20 microns, more powder is spread onto the surface, and the process repeats itself. Because the alloy is formed a little at a time, it cools quickly – retaining its amorphous qualities. However, the end result is a solid, metallic glass object – not an object made of laminated, discrete layers of the alloy. “This is a proof-of-concept demonstrating that we can do this,” says Ola Harrysson, corresponding author of the paper and Edward P. Fitts Distinguished Professor of Industrial Systems and Engineering at NC State. “And there is no reason this technique could not be used to produce any amorphous alloy,” Harrysson says. “One of the limiting factors at this point is going to be producing or obtaining metal powders of whatever alloy composition you are looking for. “And because we’re talking about additive manufacturing, we can produce these metallic glasses in a variety of complex geometries – which may also contribute to their usefulness in various applications,” Harrysson says. 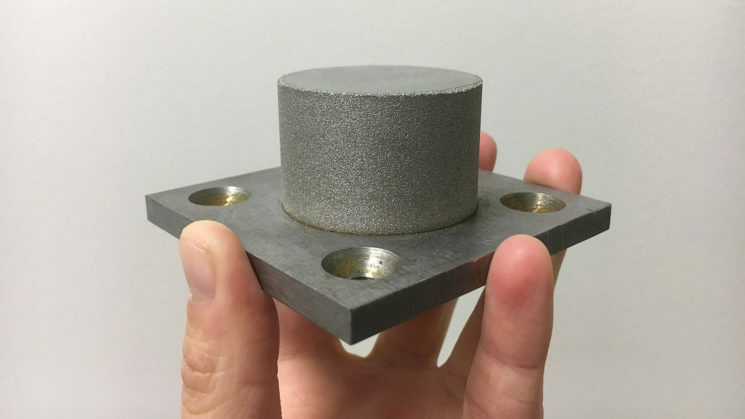 The paper, “Additive manufacturing of an iron-based bulk metallic glass larger than the critical casting thickness,” is published in the journal Applied Materials Today. The paper was co-authored by Harvey West, Timothy Horn and Christopher Rock of NC State; Lena Thorsson, Mattias Unosson and Peter Skoglund of Sindre Metals; and Evelina Vogli of Liquidmetal Coatings. The work was done with support from the National Science Foundation under grant number 1549770. Abstract: Fe-based bulk metallic glasses (BMG) are of increasing research interest, driven in part by a unique combination of mechanical, magnetic and chemical properties. However, the maximum thickness and geometry of BMGs achievable in traditional manufacturing processes is limited. This work examines the capabilities of laser based powder bed additive manufacturing (AM) to produce relatively large Fe-based bulk metallic glass specimens. AM fabricated specimens exceed the critical casting thickness of the material by a factor of 15 or more in all dimensions. Resulting microstructural and mechanical properties are reported. Despite decreasing quench effect with increasing build thickness, X-ray diffraction analysis suggests that a fully amorphous structure was maintained throughout the build. However, a low concentration of sparsely distributed nano-grain clusters was discovered using a high-resolution electron backscatter diffraction scan. The results pave the way for novel applications of metallic glasses achievable through appropriate material design and optimization of existing additive manufacturing processes.